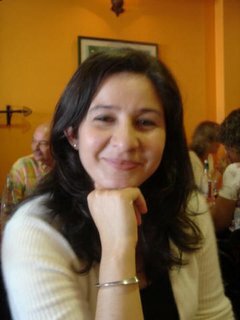 A knitting blog, interspersed with other life crises and pleasures. The Yarn Harlot, and other bloggers, have posted fabulous photos of their Christmas trees and their Christmas knitting. 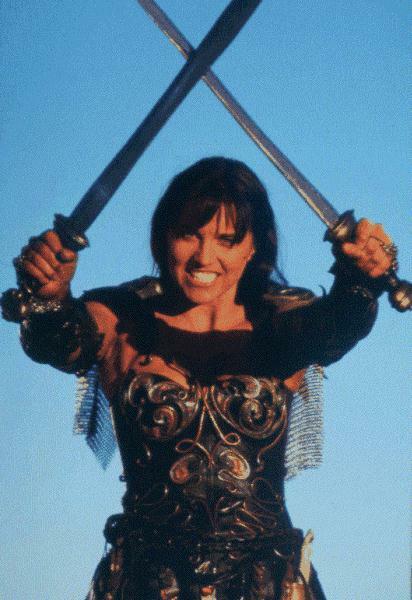 I, on the other hand, was too busy knitting to post anything. I tried taking photos of my Christmas tree, and they all turned out terribly. So, not to be outdone by the other photographer/knitters out there in blog-land, I decided to out-do everyone!! I took this photo through some "magic" lenses! 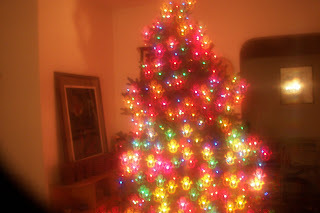 When you look through the plastic lense, the lights on the Christmas tree look like hundreds of smiling snowmen! In case you aren't impressed with that photo, here is my tree as seen through the mirror above our fireplace. 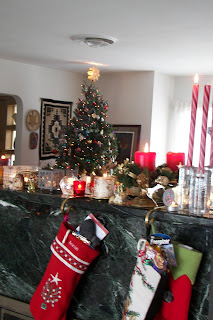 Every year I put candles on the mantle and light them during the season. I particularly like to sit in the room at night, with only the lights on the tree and the candles reflected in the mirror. Then, I hum Christmas carols to myself. One year, I lit the candles for dinner in the adjacent dining room. I kept smelling smoke, and thought that the fire smelled nice in the fireplace. Finally, my daughter screamed that something was on fire!! A candle had burned down to the wooden holder, which ignited. The heat cracked the mirror from top to bottom! We gave the mirror wide berth for the next few days, until we could get a "mirror man" to come and remove the sagging mirror and replace it with a safer one! Ever since I was a child, we have decorated our tree with cookies. 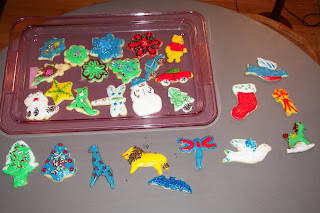 I have kept the tradition alive for 35 years now, making cut-out cookies and decorating them with frosting. Each year I invite a friend or two and my children also invite friends. We spend the evening frosting cookies, spilling sprinkles and dropping frosting-laden knives on the carpet. the invitees take home their cookies and we display ours for weeks afterwards. I don't think many cookies actually are eaten, but we get great satisfaction and joy out of them. My brother was the master froster--he made gingerbread men into Green Bay Packers, Ghandi, Donald Trump, Gorbachev and others. [My first husband insisted on making anatomically correct ginger men and women] Here are some cookies from this year. Before Christmas I complained that my children informed me that they would not wear the items I had been knitting for them. 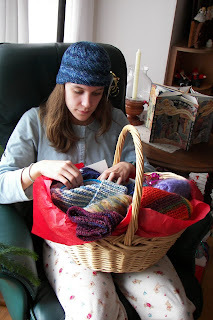 Therefore, I decided to knit random items and put them in a box from which family and friends could select an item that pleased them. If none pleased them, tough! 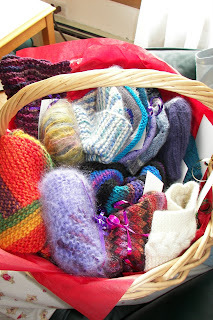 Well, here is my basket of knit goodies. There are hats, scarves, neck warmers and ear warmers. 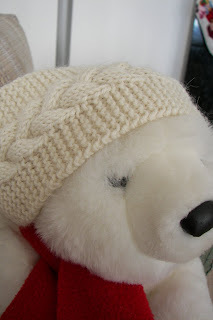 My friendly polar bear volunteered to model the items that have not already been posted. This cable knit beanie was not selected by anyone--yet. Therefore, I will send it to Dulaan or the local homeless shelter. This jaunty tam was also not selected. Bear, however, is thinking about laying claim to it! 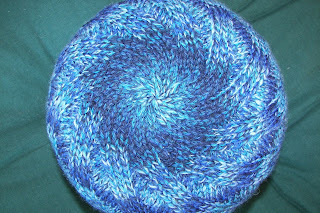 This Odessa hat, from Grumperina's pattern (without beads) was selected by my 15 year old!!! Neither Bear nor anyone else were pleased with this alpaca ear warmer. I thought it was very seasonal with the raised pine trees on it. I claimed the white alpaca cabled ear warmer! However, Bear seemed to like it as well. 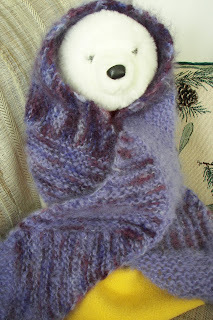 Even though Bear seemed very, very cozy in this mohair multidirectional scarf, I gave the scarf to a friend. Haven't heard from the friend about how she liked it....... If she doesn't like it, Bear wants it back!!! 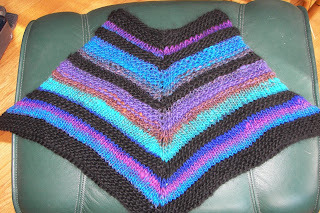 Surprise of all surprises, my 80 year old mother claimed this mini-poncho made partially out of Noro. It extends to the tip of the shoulders and Mom uses it inside of her jacket, as a neck-warmer/scarf. She really liked it!! 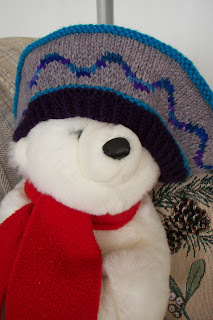 I made two of these hats from Charlene Schurch's "Hat's On" for my step daughter and her new boyfriend. They arrive on Jan. 4; therefore, I still have time to add the tassel and the polarfleece lining. We had a great Christmas with my parents and both of my daughters. My brother, the one who suffered a stroke early in the fall, and his wife also stopped by. He is improving, but still has a long ways to go before he is fully functional again. Everyone had a good time, that is, except Cosmic the cat. 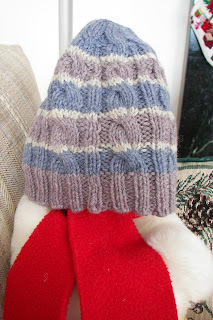 His Santa hat was much too embarrassing to wear, much less to have a photo of him posted on the blog!! 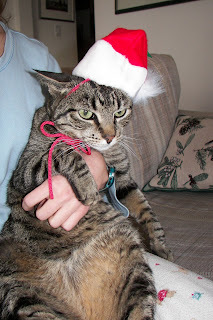 I hope you were spared all embarrassing moments during the holidays and that your New Year is filled with blessings--fiber related and otherwise! Your gifts are lovely! it is heart breaking to knit for loved ones and they don't love the knitted items. 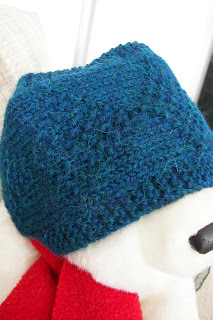 my son (4.5) deemed the hat I knit for him- "not cool enough." he does like the socks I knit for him, so we'll stick to that for now! Happy New Year! I love all your knitted gifts, even the so-called "rejects"! And I've nearly set my house on fire a time or two with the candles. The Charlene Church hat is awesome! You must tell us if your step daughter likes it!! Glad your brother is getting better & is able to get out & around a bit. Best wishes & happy knitting for 2007! I love all the knits! And I love the idea of filling the basket and letting them pick. Thanks for your comment on the Harald Street Hats! 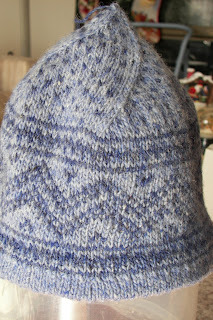 The pattern is adapted from the one in The Art of Fair Isle Knitting by Ann Feitelson. Knitting is my passion, my escape, and my sanity. I am an unemployed school librarian. My knitting accompanies me wherever I go and introduces me to the best people. Items I hope to make someday, should I live that long!